Not everyone has seen the new season of Stranger Things yet; in fact, it stayed steady at #1 this week. Perhaps this season will be even more popular than the one before it if this keeps up. Otherwise, this week was largely dominated by non-streaming-exclusive shows. One cable show made the list--The Walking Dead at #4--but other than that broadcast ruled. 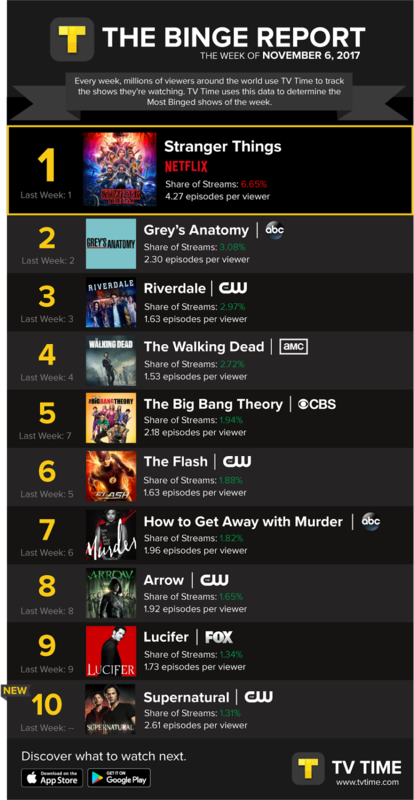 In fact, the second season of The CW's Riverdale did even better on this list than The Walking Dead, staying steady at an impressive #3. The show has certainly become a ratings success this season, both linear and non-linear. Of course, it was far from the only CW show on the list. The Flash was down a spot to #6, Arrow steady at #8, and Supernatural made an entry at #10. With four shows on the chart, it has just as many as the rest of the broadcast networks combined. This demonstrates that there is a large streaming audience for the shows on The CW, and even if they aren't all first-run ratings smashes, there is still an audience for them. Scandal continues to be the least-streamed TGIT show by TV Time users, as it was the only show of the trio to not make this list. Grey's Anatomy is showing it still has power in its 14th season, steady at the #2 spot. Also, despite declining linear ratings, How to Get Away with Murder is still on this list, down a spot to #7. It's interesting once again to note how Scandal didn't make the list, even though in first-run ratings it's more popular than How to Get Away with Murder, and actually a lot of shows on this list. Also on the list was FOX's Lucifer, steady at #9. The show is a solid ratings performer on Monday nights and apparently also has a decent streaming following. It's interesting to see how it performs around the same as The Gifted and The Orville, but beats them amongst TV Time users in streaming, as well as the rest of FOX. Finally, CBS saw The Big Bang Theory rise from #7 to #5. The fact that a sitcom is on a list dominated by serialized dramas is a huge accomplishment of itself, never mind the fact that it made the top half of the list.